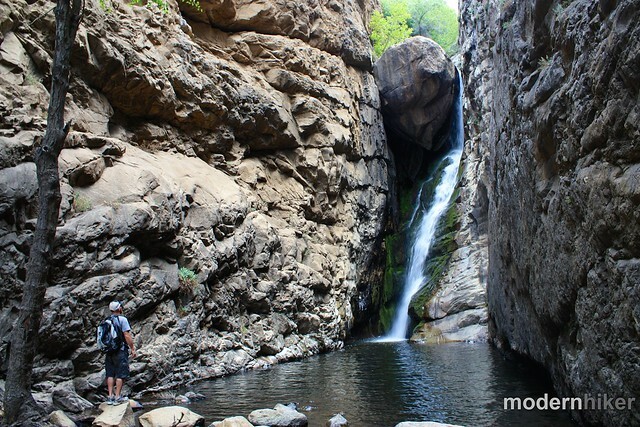 A short and strenuous little-known trip to an incredible secluded canyon waterfall in the southern Sequoia National Forest, just north of Kernville. This route is mostly on use-trails and can be a moderate rock-hopping excursion or an intense scrambling trip with a few class 3 bouldering sections. 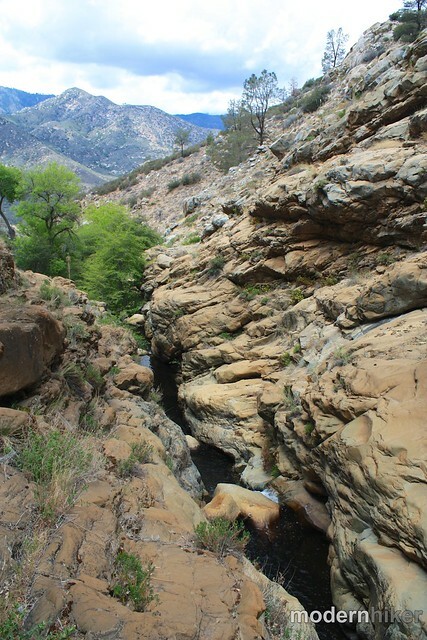 Either way, you get to see an unbelievable canyon with a majestic waterfall (and sometimes TWO waterfalls in wet years!) in a secluded grove. This area also looks to be popular with the climbing crowd: many cables have been installed near the waterfall with mostly 5.10 routes. A surprising and wonderful hike! The team at SoCalRafting.com recently invited me up to Kernville to introduce me to some rafting – but seeing as I’m primarily a hiker they wanted to make sure I also got some good time on the trail before I put on a life-jacket. 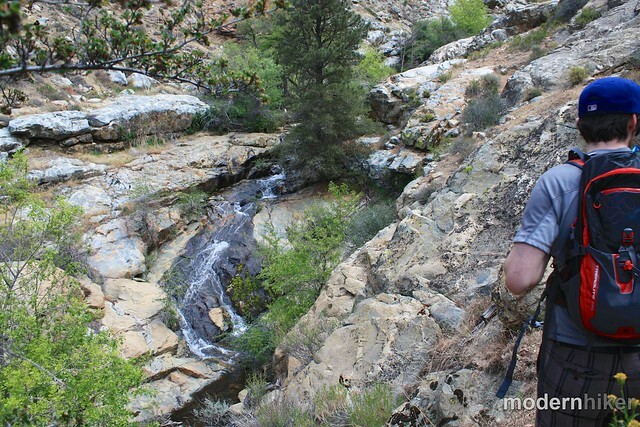 Their Online Manager Diana and Guide Manager John took us north of Kernville to a trail they said wasn’t on many hiking maps – and the roads we traveled on to get there didn’t show up on Google Maps when I looked it up online. The trail begins at the end of a service road for the California Aqueduct a flume that carries water from the Kern River to a hydroelectric plant north of town, listed as the Rincon Trail or Forest Road 33E23. 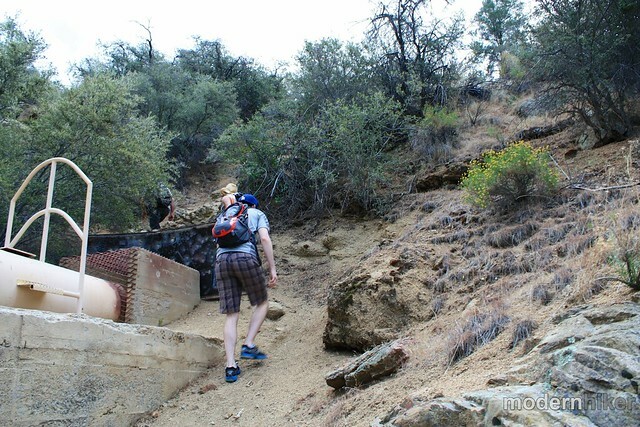 You won’t see a trailhead or sign, but you will see a use-trail leading up right next to the tunnel where the Aqueduct goes into the mountain. This route is use-trail for almost the entire route so there isn’t really a defined path, but right past the trailhead this route winds around a large bend before turning northeast toward the creek’s canyon. 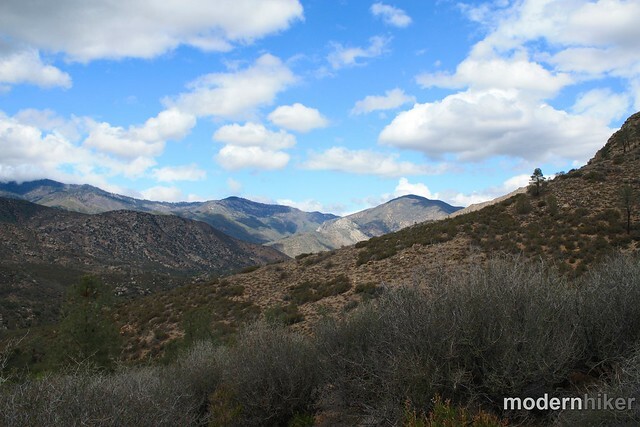 As the trail makes its way through the chaparral and reaches this ridge, the you’ll get some truly breathtaking views of the Kern River Valley and Southern Sierra Nevada. 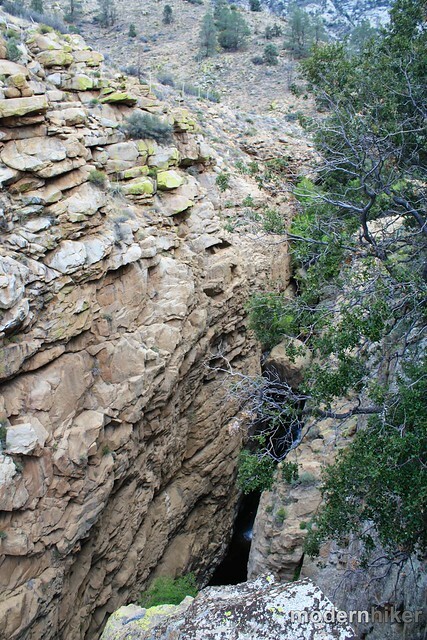 At about the 0.2 mile mark, the trail levels out a bit as it heads toward the canyon itself. The next 0.2 miles have a very gradual incline – and once the canyon walls close in on you a bit, the well-worn footpath starts its route hopping boulders instead. 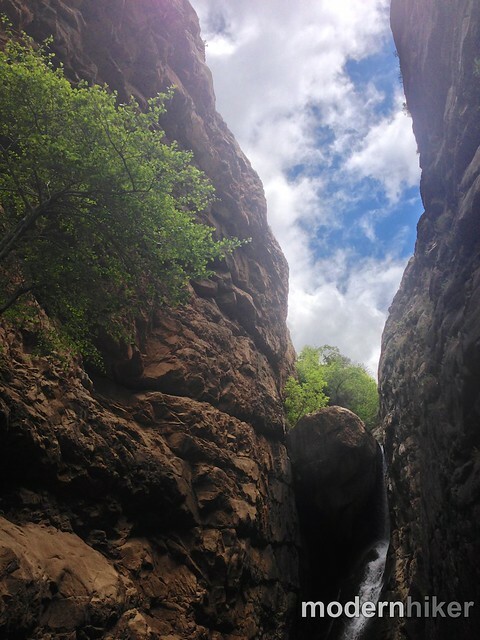 Here, the easiest path is closer to the canyon walls than the creek itself – the rock here is solid and should give your boots plenty to grip, and nothing is difficult in the lower stretch of the canyon. When you’re keeping your eyes peeled for routes, just don’t forget to soak in all the scenery – especially as the creek starts to show up below you! 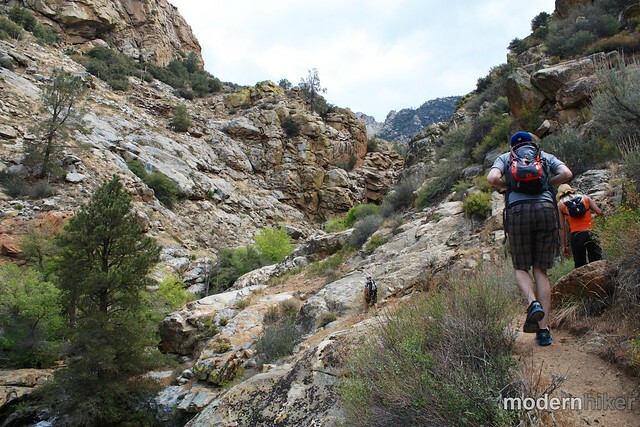 At about the half-mile mark, you can decide whether or not you want to take the moderate route to the base of the falls or the more strenuous route to a ledge above the canyon floor. 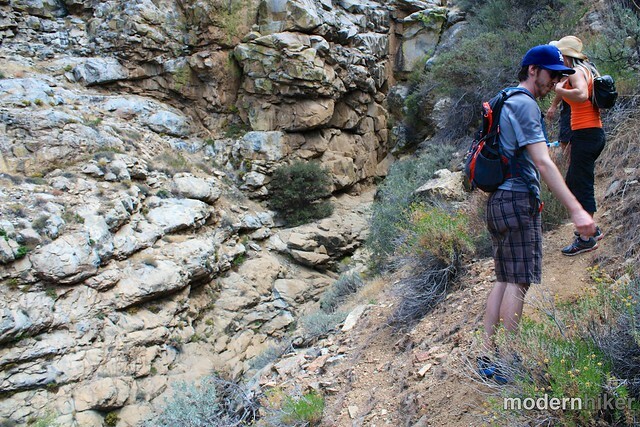 If you want the moderate route, descend to the creekside here and just follow it into the canyon. The higher, strenuous route leaves the canyon floor here and makes a serious scrambling ascent. Some of the ground here is loose but the embedded rocks usually make for good hand and footholds if you need them. While this is a very impressive perch, the views of the falls from this location aren’t very clear. There are a lot of climbing routes bolted into the wall in this canyon, and I think this ledge is probably a better place to watch climbers or congratulate them when they’re done than as a hiking destination – but it’s still fun to scramble on the trail and it’s a little nerve-wracking to toss a pebble off the ledge into the pool below and hear just how long it takes to hear a splash. When you’re done up top, scramble back down (carefully!) to the lower stream and trek on the more moderate path, too. In high water years (or at this point, normal water years), I’m told a second waterfall tumbles into the canyon as well – and the cascades are visible for miles. 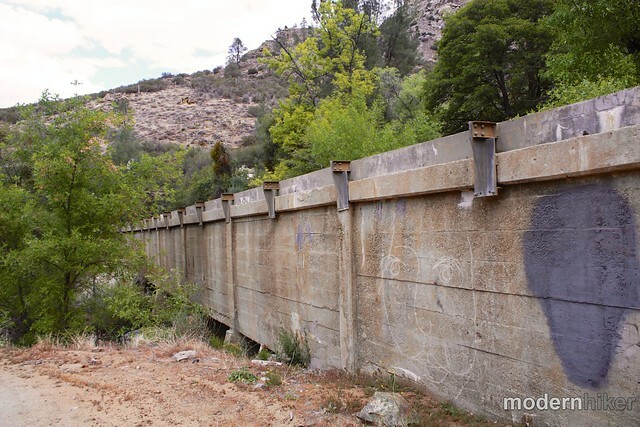 I found a few good pictures of higher water levels at this site. When you’ve had your fill, return back the way you came in. Thanks to reader Roberta Gordon for the correction on the water tube through the mountains! Unmaintained. 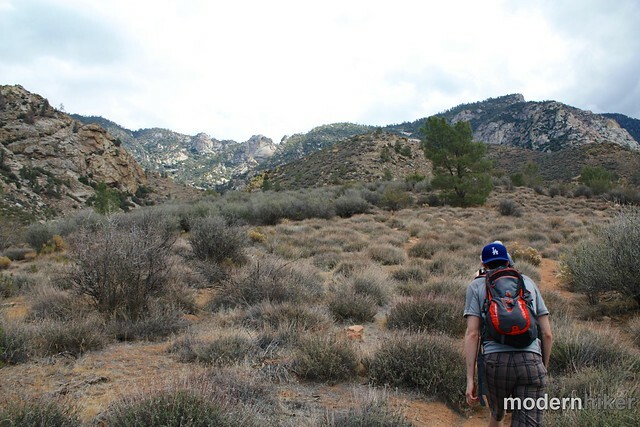 The route from the trailhead to the creek is fairly distinct and easy to follow. 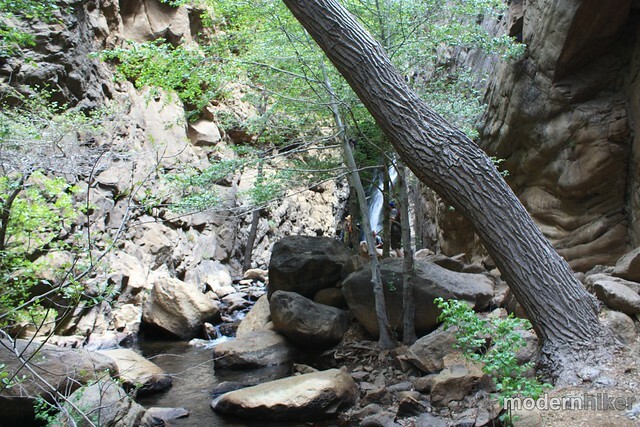 If you want to stay near the base of the falls and get to the climbing area there's a visible use-trail that hugs the south side of the creek and hops a few boulders. 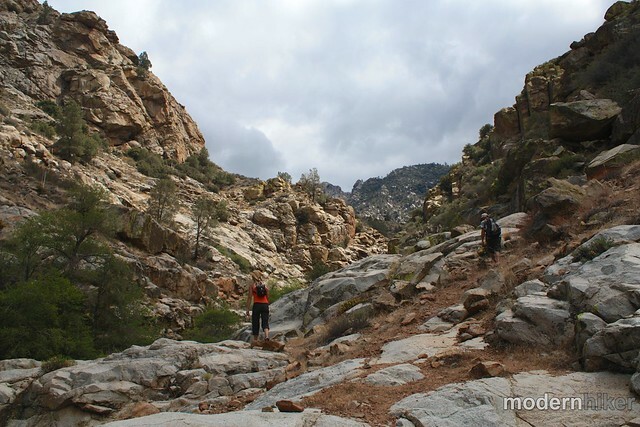 The upper scrambling route is much less apparent, although the use-trails tend to lead you in the right direction. If you do the upper route, be prepared for some moments of class 3 bouldering and some portions where you may not be able to fully see your footholds. The rock here is much more stable than the rocks in the San Gabriels, but still exercise caution. This trailhead requires a high clearance vehicle and some patience, as it's very much off-the-beaten-path. 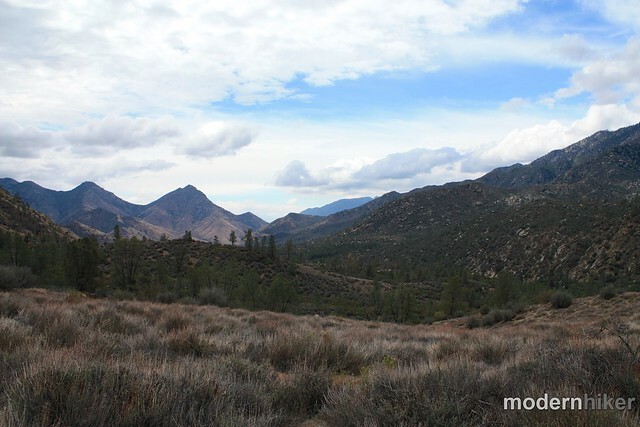 The trailhead is about 11.6 miles north of Kernville on the Kern River Highway. Look for a road just before the "Salmon Creek" sign. Follow this to a 3-way junction, stay sharp left to continue uphill. Keep straight at the 4-way intersection at sign for RINCON TRAIL 33E23. This road ends at the California Aqueduct. In my climbing days we used to go here to climb the routes most weekends when it is too hot elsewhere since this canyon is nicely shaded when it is hot and there is wonderful cold water. We call this area Valhalla, but this may only be what climbers call it. I feared that it was completely overgrown these days and would require a lot of bushwhacking. There were a considerable number of ticks way back when I was last there. Great directions to get to the trailhead. One note when getting to the trail head at the four way intersection - do not follow RINCON TRAIL 33E23. Instead, just continue straight PASSED the route. The sign shows RINCON TRAIL 33E23 going right, but as the directions state go straight. Trail is easy to follow but we missed where it drops to the lower part of the falls and started scrambling towards the top which is very sketchy.